Last year, I wrote an article for Sound & Communications magazine, "A/V Industry: A Future Woman's World?" that focused on the role women will, and should, play in the industry. Feedback from the article was very positive. I thought it would be helpful in this follow-up article to describe some of the work NSCA has done and highlight the journey of one of my expert technicians, a young woman. As a long-time member of NSCA and current board member, I've seen firsthand the association's dedication to helping women become audio visual consultants as they enter the A/V field and to supporting them once they are there. For example, NSCA hosts a "Women in NSCA" ListServ, which helps women in the industry connect, ask questions and get advice. At its events and conferences, NSCA includes women-specific programs. For example, the 2009 Business & Leadership Conference, which will be held in Phoenix in February, opens with a "Women in NSCA Reception," a networking opportunity for professional women in the industry. Session topics are designed to appeal to women and men, such as "Best Practices: Selecting Top Talent for Higher Productivity and Improved Profitability" and "The Aliens Have Landed - Meet Generation Why: Understanding, Managing and Motivating Your New Workforce." Although organizations like NSCA are paying greater attention to the needs of women in the industry, more can be done, particularly by educating young women about careers in the industry and by encouraging them to realize that the commercial electronic systems industry need not be considered a "man's world." Jessica DeLuca is one of Shanahan's expert audio engineers. When Jessica was a young girl, her grandmother encouraged her to pursue a career in nursing. Jessica followed her grandmother's advice, studied allied health and graduated from Lawrence Regional Vocational Technical High School as class valedictorian. A few years later while helping her boyfriend (later her husband) with a college A/V project, she found her true calling. She went on to earn her associate degree in audio engineering at the Massachusetts Communications College in Boston. She and her husband founded an all-ages nightclub and recording studio in Haverhill, Mass., which they operated for four years. 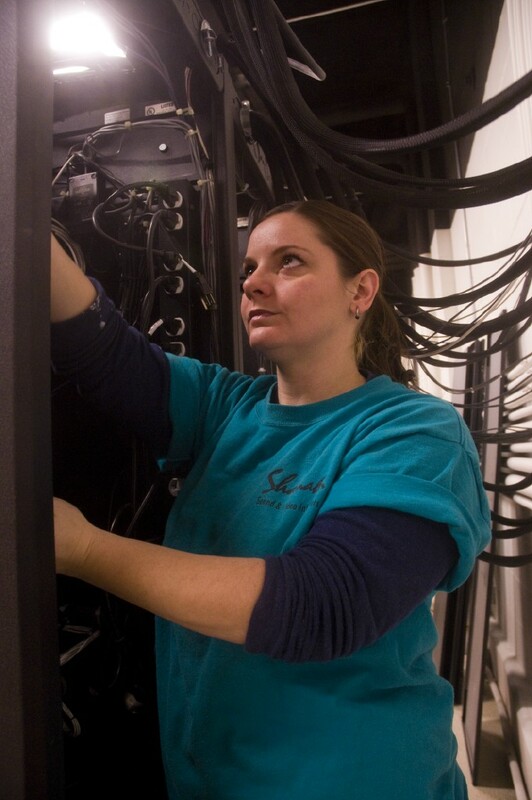 Jessica has also worked as a video conferencing technician and a home theater installer, and she has a knack for repairing TVs. Since returning to Shanahan earlier this year (she worked for us early in her career in accounts payable), she has become an integral and respected part of the Shanahan team. Recently, I asked Jessica if she encountered any obstacles or objections when she decided on this career path. She said her family and friends were supportive and that because her Dad raised her as a single parent, she knew that both men and women could fill nontraditional roles effectively. He always told her she could do anything she put her mind to. I asked Jessica if she thought her grandmother-who passed away before Jessica entered the industry-would have supported her career choice. Jessica believes her grandmother would have been proud of all her accomplishments-class valedictorian, business owner and audio engineer (and all before the age of 28). Jessica's advice for young women thinking about going into the electronic systems industry? "Don't let anyone hold you back. Whether you're a girl or guy, it doesn't matter. What matters is the dedication to your passion and the desire for success." And perhaps that is where the A/V industry stands. In today's world, it's important to realize that men and women are equally able and the new generation understands that. The rest of us need to catch up with that understanding and allow young women to operate just as comfortably within the industry as their male counterparts so that more competent and talented women like Jessica will enter and enhance our industry. Used with permission of Testa Communications from the January 2009 issue of Sound & Communications magazine. For more information, go to http://www.soundandcommunications.com/.